The summer before my last semester of Journalism School (a long, long time ago), I had a fellowship at the Poynter Institute in St. Petersburg, Fla. My roommates and I lived in a sprawling apartment complex with a pool and hibiscus bushes in a tropical neighborhood surrounded by damp forests and dark lagoons. I kept my eyes peeled for alligators when I ran those roads. Half a mile from Poynter was (is) the Dali Museum. 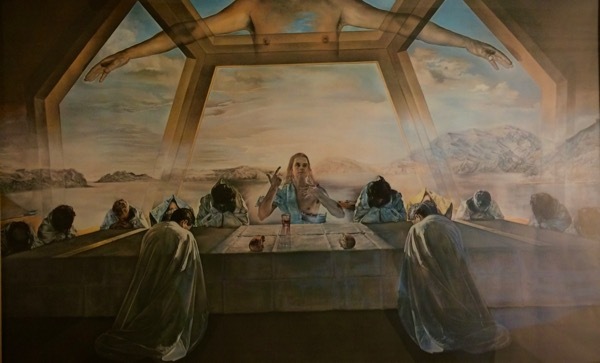 I came home from that summer with a framed print of Dali’s surreal Sacrament of the Last Supper as a gift for my mother, a lifelong Catholic. That picture now hangs on the wall behind the dining table where my dad eats most every breakfast and lunch (but not dinner, because dinner he eats downstairs in the dining hall with other residents of his retirement community). Lately, I’ve been thinking a lot about Last Suppers—appropriate, this Easter week. But the Last Suppers I’m thinking most about are those we cannot predict, and those that ultimately rest in memory as the final meals connecting us to people and places that shape who are are. My Last Supper with Aunt Helen was a picnic celebration of my mom’s 80th birthday. I didn’t know it at the time, but that would be the last meal Helen and I shared, with plates on patio tables and dozens of others enjoying the warm sun of a summer afternoon in 2016. Aunt Helen’s heart failed a few days ago. I was lucky to have talked with her last week, while she was still alert. And I was lucky to have seen her asleep, peaceful, just a couple of days before her death. But the outdoor party in 2016 will be my last memory of us eating and talking together. A few months before that, Jerry and I emptied out my parents’ house of 35 years—the house where I’d grown up—as they transitioned to a smaller, manageable apartment with no stairs. Their house grew barren as, piece by piece, every table and chair and couch and bed disappeared. It was just the two of us after a long day of lifting, lugging, and scrubbing. Dinnertime came, along with a big hunger. 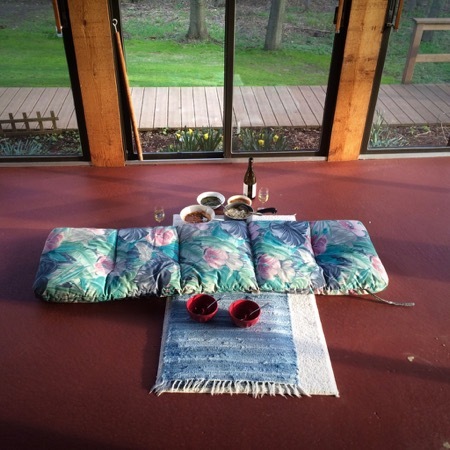 We still had a couple of old lawn chair cushions, so we spread one across the concrete floor of the screen porch my mother had loved for its sun and warmth and proximity to the trees and birds. We bought a few curries (unlikely to have ever been served in that house before) from an Indian market up the road, and we ate on the floor as spring’s cold, crisp light started to fall. 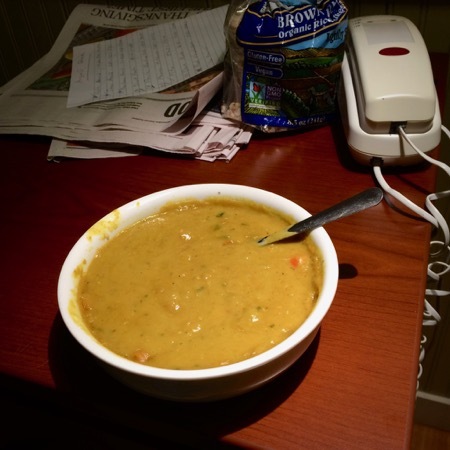 It was only 7 months later when I bought a carton of red lentil soup one night at the grocery store near the hospice where my mom slept through her last days. I spent the night on a pull-out bed in her room, and I ate the soup at the table beside her. And that was our last shared meal—I with my hot bowl of soup and she breathing steadily, asleep beside me. I don’t remember the taste of that soup, but I will never forget that meal. That’s the thing about Last Suppers: they are ever more poignant in retrospect. Some of life’s most important meals have nothing to do with the food we eat. It’s all about the context in which we eat it. The thing is, we often have no idea when those Last Suppers will be.